CEO CookOff : Thank you to our sponsors! The CEOCookOff is shaping up to be an incredible night – and that’s thanks to the amazing support we’ve received from leading food, drink and homeware brands. 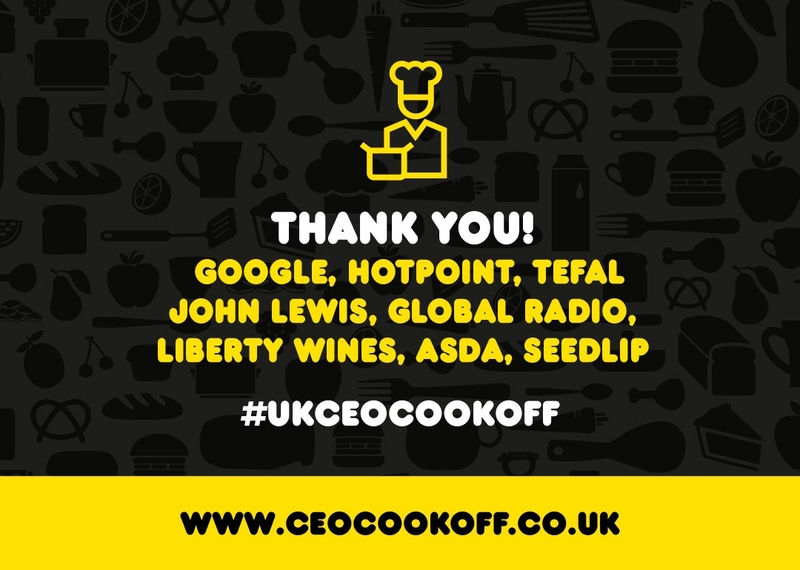 Companies including Google, Hotpoint, John Lewis, Global Radio, Tefal, Liberty Wine, Asda's Wonky veg, and Seedlip have all generously pledged their support to the event. Google has helped secure our beautiful venue – amazing! Hotpoint has provided the design and equipment for 30 kitchens (including the latest ovens, hobs and fridges) and helped us build them. Wow! John Lewis has provided various kitchen utensils for our 30 kitchens – thank you! Global Radio has donated airtime with Heart.FM breakfast show. Hosts Emma Bunton and Jamie Theakston are joining Jamie Oliver for a campaign to find 'everyday heroes'. The company is also giving the top fundraiser £25k worth of advertising value for their company. That’s worth celebrating! Tefal has provided various kitchen utensils for our 30 kitchens, thank you so much! Liberty Wines is providing wines for the dinner. We’ll toast to that! Asda's Wonky Veg is providing a whole array of fruit and veg from its ‘Wonky’ range – fighting food waste and giving us some delicious ingredients - awesome! Seedlip is providing the non-alcoholic cocktail bar with staff at the event – hooray! Plus, all the equipment we’ve received will be re-donated on to UK schools to help them provide cookery lessons on site. There are further donations lined up from other fantastic companies as well, so will keep you posted on the generous support we receive closer to the night itself. Check out our leaderboard to see how much our CEOs have raised so far! And you can donate to the cause here.